The number of property millionaires has increased by 20pc in the past 12 months as two €1m properties are sold in Ireland every day. Year-on-year residential property values have risen by 7.3pc. In total, there is now €420bn of housing wealth in the country. Experts say many of those selling their plush homes are doing so in anticipation of property tax hikes next year, with Brexit and emigrants looking to return home also driving inflation at the premium end of the market. New figures compiled by Daft.ie show there are more than 4,500 property millionaires in Ireland. Figures in the 2018 Daft.ie Wealth Report show 4,583 homes are valued at more than €1m, an increase of 762 (20pc) compared to this time last year. The increase in property valuations over the past 12 months has created two new property millionaires every day. The highest concentration of property millionaires is in affluent parts of Dublin, with Dalkey, Blackrock and Rathgar accounting for more than 1,500 of those with homes with a value in excess of €1m. Over the past 12 months, an average of 15 properties worth €1m or more have been sold every week in Ireland. More than 800 transactions in 2017 came in at €1m or more. Since January 1, at the upper end of the market, 266 transactions of at least €1m have been completed. Economist Ronan Lyons, and author of the report, said Brexit was contributing to the push at the top end of the market. He said couples are returning with seven-figure budgets after selling-up in London and making maximum returns on the “extraordinary level of prices” in the UK capital. Stephen Day, residential department divisional director of estate agents Lisney, said emigrants are also returning from the Far East and looking for homes in which to raise a family. Supply, he said, was being fuelled by an anticipation that local property taxes will substantially increase as part of a review next year. He said these property millionaires are looking to sell to avoid a tax hike. Other people are empty nesters looking to move on to smaller homes, he added. “People are also five years older and starting to think it is now time to get in to a more manageable property,” Mr Day said. Property tax is to increase from next year with Finance Minister Paschal Donohoe planning to stick with calculating the tax based on property valuation when he announces the outcome of a much-anticipated review. “The potential for the property tax to dramatically increase next year is definitely influencing some people,” Mr Day said. “There is an element of people getting organised. “There is potential for a dramatic increase once the revaluations come in next year. People are paying property tax on 2013 levels but the market is up 40pc since then so their property tax is going to significantly increase. Much of Ireland’s housing wealth is concentrated in urban centres and despite making up less than 1pc of the country’s land mass, Dublin accounts for 40pc of property affluence. Based on average asking prices, 19 of the country’s 20 most expensive areas are in the capital, with Dublin 6 topping the rankings at €593,997. Experts say this is not unhealthy but it is a sign of the how dependent the country is on clustering and industry around the capital. This is also shown up in the performance of Leinster’s other top performing areas when it comes to measuring property values. Digging deeper we can see Sandycove in South Dublin is the most expensive address in the country with average asking prices last year of €910,000. The next four most expensive markets in Ireland are areas close by in Mount Merrion (€821,000), Foxrock (€818,000), Dalkey (€758,000) and Sandymount (€726,000). “This is good news for those homeowners but it also tells us about how our economy is changing,” said Mr Lyons. Sandymount has seen the single most expensive sale of 2018 so far with a home there changing hands for €4.5m at the end of April. Eglington Road in Donnybrook, Dublin 4, is the most expensive street, followed by Torquay Road in Foxrock and Wellington Road in Ballsbridge. All of the top five most expensive towns outside the capital are within commuting distance of Dublin city centre in Co Wicklow. Four of the top five Leinster counties, Wicklow (€325,000), Kildare (€256,000), Meath (€251,000) and Louth (€210,000), are also in the Dublin commuter belt. Kilkenny (€214,000) is also among the top five Leinster counties when Dublin is excluded. 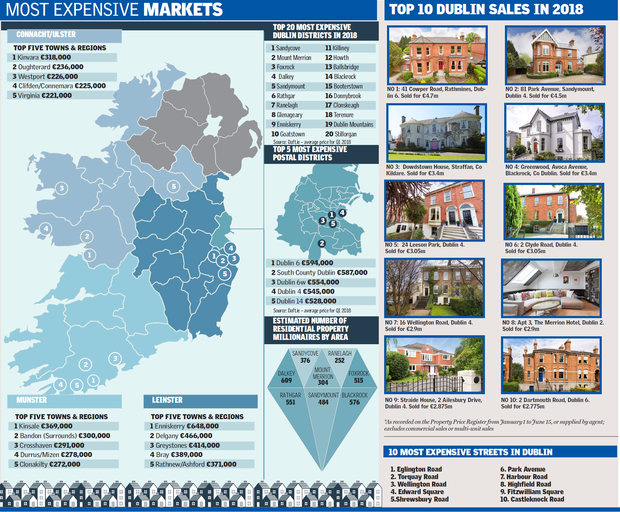 Enniskerry is the most expensive market outside Dublin with average asking prices last year of €648,000. Delgany, Greystones, Bray and Rathnew/Ashford complete the five most expensive markets outside of the capital, showing a significant east-west divide. Mr Lyons has also compared housing wealth with five years ago when prices bottomed out. “Seen this way, there are some interesting trends. What some may have thought of as the less glamorous parts of the greater Dublin area have seen the biggest jump in the rankings. “Five years ago, as prices were bottoming out, Dublin 10 (Ballyfermot) was ranked 51st by average price. Now, it is ranked 34th, a rise of 17 places. Looking at the rest of the country, Kinsale is the most expensive townland outside Leinster with average asking prices of €369,000. It is closely followed by the commuter towns around Cork city at €359,000. Average asking prices in Cork city are €261,000, compared to an average of €213,000 in the county, largely due to high values in the Bandon area (€300,000), Crosshaven (€291,000), the Durrus/Mizen area (€278,000) and Clonakilty (€272,000). Of the counties and cities outside Leinster and Cork, Galway city had the highest average asking prices at €274,000, followed by Co Waterford at €211,000 and Co Galway (excluding the city) at €194,000. The two least expensive markets are in Roscommon and Donegal with Ballaghaderreen at €89,000 and Bundoran at €90,000. The most expensive listing this year was Luggalla, a 1787 Guinness estate set in the Wicklow mountains. The asking price: €28m.